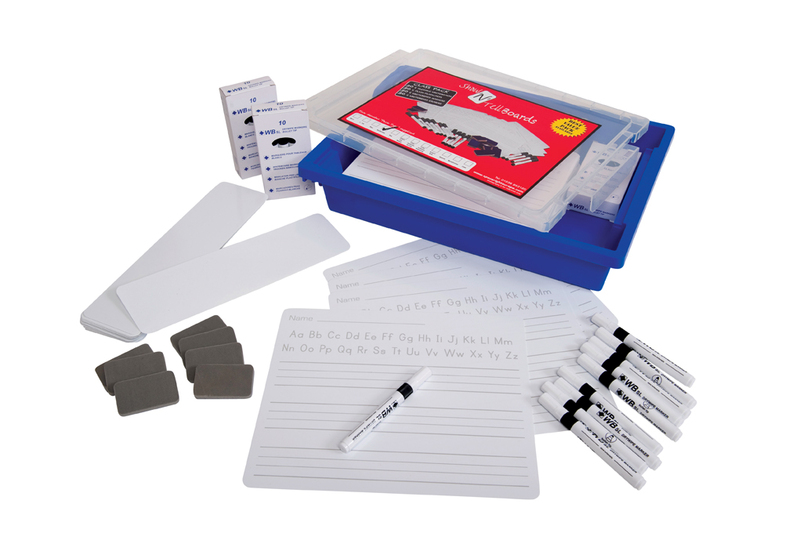 This class pack of 30 mini-whiteboards are ideal for use in primary and secondary schools. The pack includes everything you need for use with 30 students. This lapboards class pack comes complete with everything you need for 30 pupils. In the pack are 30 A4 sized flexible lapboard, 30 1/3 A4 flashcard sized lapboards, 30 dry marker pens and 30 mini whiteboard erasers. The A4 sized flexible mini-whiteboards are available in a choice of 12 writing surface options - plain, lined, squares, music, handwriting, time, 1-100, pre-cursive, cursive, X&Y grid, multiplication and letter vowels. Choose the plain, lined or squared surfaces for everyday subjects and activities and the music staves option for teaching children about music. The time, 1-100, X&Y grid and multiplication surfaces are for teaching children about time and mathematics, and the pre-cursive, cursive, handwriting and letter vowels options for teaching literature and handwriting. The pre-cursive writing surface is for teaching students about simple letter formation and the cursive writing surface is for working on joined-up handwriting. The white boards are double sided with dry-wipe surfaces and should only be used with dry wipe marker pens. Work can easily be altered and erased without any mess by using the foam erasers. This can help students who may lack confidence in taking part in class activities and putting forward their ideas in front of peers. Supplied in a Gratnells tray with a secure lid, the class pack is easily stored and transported between classrooms for multi-use in schools. Using lapboards in lessons helps to reduce paper wastage in schools as they can be used time and time again. Manufactured from 500 micron plastic, the mini-whiteboards are flexible, durable and weatherproof so the class pack is ideal for taking lessons outside in warmer weather for outdoor learning. A4 lapboards are available in 12 writing surface options - plain, lined, squares, music, handwriting, time, 1-100, pre-cursive, cursive, X&Y grid, multiplication and letter vowels.